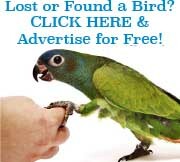 On this page we will advertise for free any birds of yours that you have lost or any birds that you have found. We suggest you describe the bird/s by giving the species name and by describing the physical appearance briefly. Do not mention ring or micro chip numbers here. Make sure the callers identify the bird/s before you let them see the bird/s and before you hand it over! Please provide the following information in the form below: your name, the date that the bird was lost/found, your contact telephone number and/or email, and the description of the bird. 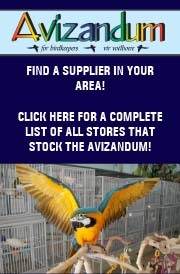 This is a FREE SERVICE to you from AVIZANDUM! LOST – 10 April 2019: Roodepoort. My African Grey, approx. 2 years old. Has a small tiny wound on left side of his head, one nail on right foot not grown properly. His tail is Red. He has a ring but may have been cut off or changed. He talks and says some our names . Kaamilah , Kulthoom (or Kul) . “Wheres Kulthoom” , “Mummy” “Daddy” and he talks a different language says “Masmuka” “kayfa haaluk” “assalamyalaykum” . He kisses alot. “Scratches on the floor like a dog in the morning” Please please if anyone has him or knows exactly where he is , we are willing to give a reward if he is returned safetly. He may have fallen in the hands of people that sold him. This is our baby and he has been so close to us and it is like losing a child. We cannot cope with our day to day lives. Please we are willing to offer valuables in exchange for our bird. He was last seen in a white cage full of toys according to a tip off. Please help us. Contact 0659811510 or watsapp 0711079432. LOST – 5 April 2019: Monumentpark Pretoria. She is a Jeyden Conure 4 months & 2 weeks old. Was on my shoulder in the house and flew off for an unexpected noise. Been searching the whole day and have put posters at the main entrance of the complex. LOST – 12 Maart 2019: The Rest, Nelspruit, Mpumalanga. Good day My Blue an Gold Macaw flew away. It is a female, and her name is Rocco. We find out that she is a female after we named her. She is really tamed and she will take food from any person, because she lived in an outside cage on our farm at Maskmountain Lodge in the Play Park, next to all our other birds. She is used to movement of the public and also children. LOST – 3 – 03 – 2019: Halfway Gardens Midrand. A beautful split yellow and red mantel parakeet flew away. Semi tame will take apple and biscuits from one’s hand has a slightly hunched back and some of its wing feathers were clipped. Flew away in Halfway Gardens near Midrand High School. Reward is offered. Please SMS if found. 072 438 0127 Thank you, Jake. LOST – 1 March 2019: Vanderbijlpark, CE1. Hello ….please help me find my African Grey parrot….his name is Kokkewiet. He got lost 1 March 2109 in Vanderbijlpark CE1. I would be so happy if you can call or whatsapp me if you seen or have him thanks. LOST – 27 October 2018: Rondebosch Cape Town. LOST: Eclectus green parrot with orange/yellow beak, blue flight feathers and red feathers underneath wing. FOUND – 26/08/2018: The reeds. Indian miner found at a school in the reeds centurion. Wings are clipped. Well trained. Please contact Ann on 0844591237. LOST – 17.04.18: Izinga umhlanga. My African grey flew away from her cage on the 17.04 18. She is grey with a red tail. She answers to the name muffin. Please if anyone finds her contact Sandra on 0824556154. There will be a reward for anyone that’s finds her. LOST – 11 April 2018: Ninapark Pretoria North. Lost my African Grey named Birdie. He is ‘n Afrikaans speaking bird. When you try to pick him up he will say “klim op”. He also says “baai” in a man’s voice and then in a woman’s voice. He whistles the starwars theme. He also laughs quite loudly and will call out his own name. He is almost 14 years old. Please help us find him. We offer a reward of R2000. Contact Roan on 0727372929. LOST – 04 April 2018: Waterfall Kwazulu Natal. My cockatiel named Grey is missing from valley Road Waterfall. He is Grey with yellow/orange cheeks, tries to sing Happy Birthday, and Says “hallo Grey Grey, and ” Hallo pretty boy. Please if you spot hi, please phone me on 0835652630. LOST – 12 march 2018: Crestbrook,brookdale. Lost: 12 March 2018. Please help us find my Baby Boy Skyler. He is tame and playful. Sky blue on his head and his whole body is green, his tail is grown half and dark blue. He whistles, shakes his head around when happy, walks from one end to another. He says snippy, hello baby, where’s the boy/baby? He doesn’t have a ring. We are missing him, he is part of my family. Phoenix Durban area. Got him as a gift. WhatsApp 0743246243 / 0743311927 thank you in advance. Randpark Ridge. Baby green cheek Conure found middle of February. Kindly contact me on 0743395568. LOST – 3 maart 2018: Moot of montana. Scarlet Macaw het uigekom en gevlieg. Haar naam Roxy. Sy mak en praat. Uitgdkom by 19de laan. Sy is gesien in vleiloeriestraat montana park 4 maart. Asb as iemand haar sien kontak Karlien 0843337002. LOST – 3rd March 2018: Northcliff, Randburg. I lost a male Eclectus with a ring on his right leg. I’m so worried about him, because I’m scared he cannot survive on his own in the wild. I miss him a lot. Please contact me anytime if anyone sees him on 0812694393 Ryan. LOST – 20 February 2018: Cape town grassy park western cape. His name is Pablo He loves apple Says apple Come mama come And calls my husband’s name Nabiel And a few other things He went missing 20 February 2018 and its been the 3rd day tday we would really appreciate if u can help us find him we really miss him so much hope someone honest can find him and return him thank you Contact aswel on 0813272908. LOST – 17 February 2018: Moffat view. Please help us find our Baby Red Tail African Grey, 2 ½ years old… She is fun, loving, affectionate, feisty, speaks very fluently. She swears a lot and responds to Cookoo, Cody, Codes, Girlie… She is big size with a black rounded beak, loves kisses and loves being held like a baby and rocked from side to side… Loves attention and will be drawn to you when giving her apples or mealies on a corn. Please contact Shandré Duwarkah on 065 869 2845 (084 883 4275) or Suran Duwarkah on 084 322 3892. She went missing in the south of Jhb. Please help us find our child. Reward will be granted. LOST – 16 January 2018: Impala Park, Boksburg area. Very Tame White (Albino) Cockatiel lost since 16 Jan 2018 Impala Park, Boksburg Area. His name is Coco and he will fly to you. Please contact rene on 082 856 4195 if seen or found. LOST – 10 January 2018: Randpark Ridge. Lost African Grey Congo female parrot. Corner Dale Lace and Scott Ave Randpark Ridge. Ring on left leg. Between eight and nine years old. Tame and talking. 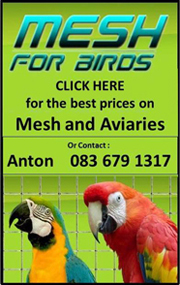 Please Call Marie on 0839509007. LOST – 07/01/2018: Kyalami / Midrand. Good day all. We had a small tame budgie inside our apartment that escaped and flew off the balcony into the bushes at the bottom of the Riverbend Estate in Kyalami / Midrand. She has a yellow head an blue body. If by any chance she ends up inside any of your gardens seeking food and water please contact me on 0764104800. Thank you. LOST – October: Waterfall. African Grey escaped from his cage in Waterfall , 5 years old , please contact Frieda or Stephen 0760669630 / 0826545581. LOST – 15 September 2017: Orkney North West. My Breeding Yellow Collard Macaw got out on 15 September 2017. It is a green bird with a black head, yellow collar and maroon in its tail. Please contact me on 0718961750 if seen or found. Reward if found, thanks. LOST – 10/09/2017: Gauteng. Please call if you find my Baby African Grey. Last seen yesterday flying in direction of Linden, Johannesburg, Guateng. Flew off yesterday between 10:30 and 11 am Sunday morning, am desperate to find him as soon as possible. Please contact me on 0832766743 or Lilly on 0607333309. LOST – 22 August 2017: Birchleigh North, Kempton Park, Gauteng. I lost my grey white face Cockatiel 22 Aug 2017. Very tame and responds to the name Pepper. Bird has grey body with white face and black eyes. Also has a silver band on leg. Please help me locate him. Reward will be offered. Please contact Candice on 078 187 4289 or email candice.nortier@gmail.com. LOST – 01/05/17: Queensburgh. 1/05/17: Queensburgh. 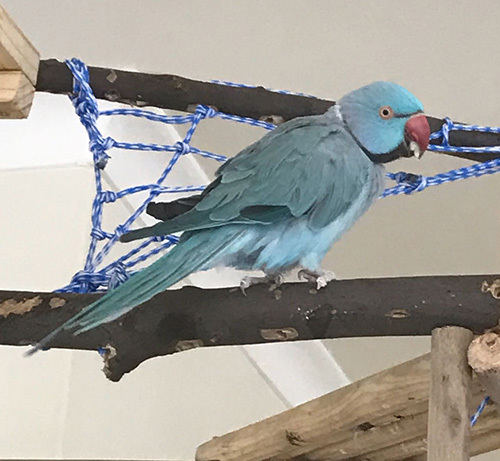 Hi,I lost my purple Ringneck in Escombe -Queensburgh , He is an adult bird with a ring around his neck and has a silver ring on leg. Please if found contact me on 0719399248 A large reward will be offered.Thank you..
LOST – 1/05/17: Queensburgh. Hi,I lost my purple/blue Ringneck in Escombe -Queensburgh , He is an adult bird with a ring around his neck and has a silver ring on leg.Please if found contact me on 0719399248 A large reward will be offered.Thank you. LOST – 2 APRIL 2017: ROODEPOORT / KLOOFENDAL. LOST MACAW IN THE ROODEPOORT / KLOOFENDAL AREA. REWARD R2000. PLEASE CONTACT ALEX 0845039851. LOST – 12 March 2017: Kenmare Krugersdorp. Lost :BLUE RINGNECK NAME: BAKKIES/BOETIE WENT MISSING ON 12 MARCH 2017 IN THE MORNING. GENILDA 082 571 6606. Please help me find my baby. LOST – 12 Feb 2017: New Germany. Our White(albino)Cockatiel flew away. Because he is albino, eyesight not to good. FOUND – 20/02/2017: Waterglen. Found yellow ring neck . Has a ring on his leg . Owner to provide positive identification of numbers before collection of bird. Please contact Kenny Aspeling at 0761735448. LOST – 19/02/2017: Mayfair, Johannesburg. Please help in finding my African Grey bird that flew away this morning. Birds name is Mirza. A reward of R500 to the person that finds my bird. Contact Jasmin 083 307 8280 or Rashid on 083 563 6519. You assistance in finding my bird is highly appreciated. Thank you. Most said words are faheemah, naughty boy and whistles. However he tends to be quiet around strangers. LOST – 10/02/2017: PLEASE HELP – My light blue Indian ring neck male went missing on Friday evening in the Craigavon / Fourways area. His name is Charlie – quite scared of new people. I assume he could be anywhere between Craigavon, Fourways, Douglasdale or Bryanston. Please help me find my baby!!!! Please share my post to your wall and every animal group you can!! If you see him / he comes to you for food please contact me – Stacy 0825950231. Reward offered for safe return 💜. LOST – 06/02/2017: Kriel, Mpumalanga. My green Quaker Parrot escaped from our house in Impala str. near Sasol Garage and OK. If someone has seen him please contact me at 0763124438. LOST – 2 February: Grassy Park, Cape Town. Found Pets: Congo African Gray, named Blu missing… She flew from Lake Road Grassy Park towards Klip Road… must be in the area as it was already after 7pm… She talks, mimics sounds of car alarm, door bells, ring tone and barks like a dog. She also calls several names, Melisa, Elle-Tao, Lemore, Roy, Lulu and Elle. Loves talking and is friendly… please she has been with us since she was 8 weeks old… She is only 4yrs old now and is currently receiving treatment for kidney infection… I am begging you to please keep your eyes and ears open and let me know if you see or hear her… Thank you… REWARD OFFERED IF FOUND… CONTACT SPCA or ME on 061 298 9970 or Roy at 073 148 1685. LOST – 02/01/2017: Wonderboom close to Braam Pretorius. Good day All. My yellow male Alexandrian went missing about 2 weeks ago. He has a pink ring. The Female bit him and we were busy to treat him. 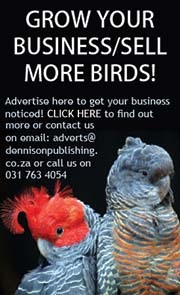 I am willing to give a R1000 reward to anyone who can give my bird back. Anyone who can show me where the bird is. Any assistance will be much appreciated. I can send a photo on request. Drieka 0836458608. FOUND – 14 January 2017: Houtbay, Cape Town. A (presumably) young Pionus Parrot was brought into HoutBay Vet, was on deaths door, but presently being nursed back to health. LOST – 15 Jan 2017: Southfield. My African Grey “Spaz” is missing, he was last seen in Como Road in Southfield.Please if you have any details or know of his whereabouts let me know on the contact number or 0761294334 or 0217052985. Any help is appreciated. LOST – 25/11/2016: Swakopmund Namibia. Blue/Turquoise Ringneck. Was 8 weeks old when flying away on 25 November 2016. Alberton North. Please please contact me. There will be a reward. That is our baby. FOUND – 13 November 2016: Sundowner | Northwold. Yellow & orange parrot with blue & green tail flew into into my house. LOST – 13 November 2016: Norwood Orange Grove. MISSING!!!!!!!! African Grey missing- Norwood JHB. Please spread the word – very tame very loved and goes by the name Ruby. She may land up in someone’s garden. It can take days but if we all keep our eyes open we can find her. No judgments required only positive assistance! 3 November: centurion. ringed African Grey. LOST – 16 October 2016: Benoni/Boksburg. Hi, Lost my blue and gold macaw. Reward offered for capture / return. FOUND – 2016/05/17: Sonstraal Heights / Brackenfell. Green & Yellow Budgie found. LOST – 10 March 2016: Annlin, Pretoria. GROOT BELONING! Groot asb julle help ons ons kind terug kry. Rosemary/Parsley Str Anllin. Hy het geskrig en weggevlieg. Sy naam is Thabo en is mak en kan nie byt nie. Praat baie en sy gunsteling se goed is – Hallo Thabo Hallo my liefie Wat maak jy ? LOST – 16 Jan 2016: Hazldean. MISSING!! Cockatiel. Loves kisses but NO scratches. LOST – 01/01/2016: Simon’s Town, Cape Town. African Grey, LOST on evening of 1 January 2016 Named NANNA Red tail, wings not clipped. May be in the vicinity between Boulders, Simon’s Town, and Glencairn. She only allows one handler, may accept a WOMAN, and will fly if approached by a man. Contact if seen.